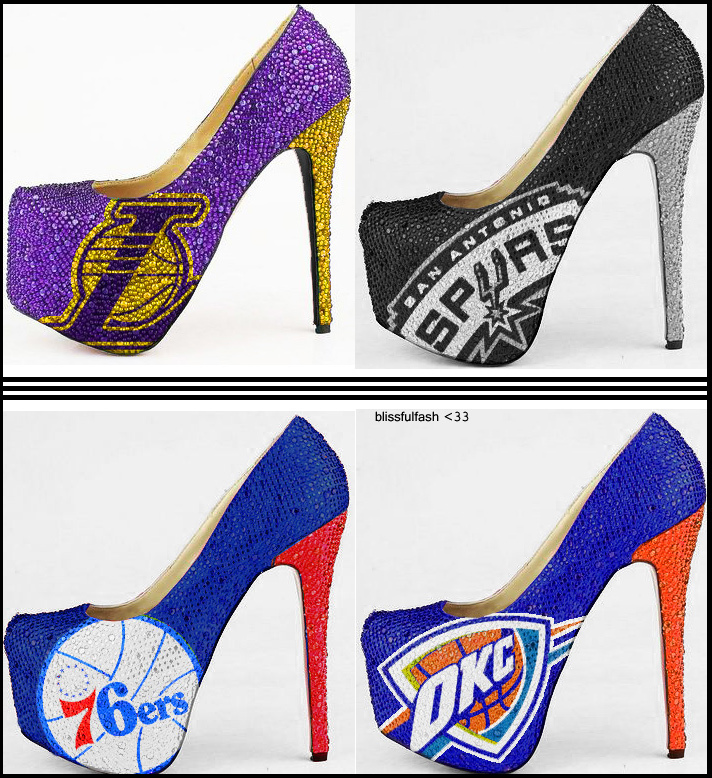 Pieces I Like: In-Process NBA Heels! So recently a company named Herstar based in Orlando, Florida is awaiting a final decision from the NBA regarding these shoes. I came across these heels on a website I frequent and I love them! These are great for those basketball wives we see on TV, courtside and otherwise. These are also great for the regular woman that loves basketball or wants to make a statement during a game or at an afterparty. My favorite ones are the San Antonio Spurs, not because they are my favorite team but because, in my ,they are the most classy & I love black heels! I could see myself wearing those. Coincidentally the Spur heels are the most popular, being closely followed by Los Angeles Lakers and then Oklahoma City Thunder. All 30 teams will be available after the Herstar company gets the OK from the NBA, but for now we’ll have to wait to even get our hands on a pair because they are already backordered by the hundreds. Other teams available right now are: New York Knicks, LA Clippers, Boston Celtics, Philadelphia 76ers and the Miami Heat. Do you guys like these shoes??? SN: If you guys would like the other pictures posted just leave a comment below! I Broke Down!…I OFFICIALLY Give Rihanna the Crown! !